At the Winter Olympics, Russia wants to showcase its modern, glamorous and glitzy side to the world. Sochi is ready for its Olympic debut. When the world tunes in to watch the 2014 Winter Games, it will see futuristic, state-of-the-art stadiums nestled next to the Black Sea, breathtaking views from world-class ski resorts in the snow-capped Caucasus mountains, and a sprawling new Olympic Park framed by subtropical palm trees. It has been an epic seven-year adventure to prepare for the Games, which organ-isers hope will formally introduce the “new Russia” to global audiences as a modern, dynamic country. The transformation of Sochi is all the more remarkable as none of the facilities existed a few years ago. When the Sochi bid was selected by the International Olympic Committee (IOC) in 2007, there was much grumbling that its defeated rivals Pyeongchang in South Korea and Salzburg in Austria were more worthy choices. Both could point to existing facilities ideal for Games events. But Sochi’s vision prevailed and the race has been on to deliver what was promised. Indeed, the finishing touches were still being put on some venues, including the Fisht Olympic Stadium, built specially to host the opening and closing ceremonies, as the New Year arrived. The opening ceremony on February 7 promises to be a moment of high drama, not just for the world but also for the Russian Olympic organisers. All the new competition venues in Sochi have been put to the test by hosting international events. The ski jump area went into service only recently after significant delays and cost overruns so outrageous that the head of the project was reprimanded onnational television by President Vladimir Putin. The new mountain train, which will whisk Olympic visitors between the Coastal Cluster and the Mountain Cluster for events, went into service this ski season. Russia can claim to be breaking new groundby staging the Winter Games in Sochi. The traditional model for host cities has been to take a proven winter resort area, spruce it up, add a few modern touches, and not worry too much about anything else. Russia proposed to start from scratch in a city with no alpine ski tradition to speak of and one that is better known among Russians as a summer resort on the Russian Riviera. Indeed, Sochi’s subtropical climate makes it one of the warmest places in Russia in winter, and a bold choice for Games host. Mr Putin’s address to the IOC in 2007 was widely seen as helping to clinch the Games for Sochi and he has been very much associated with the whole project. Thoughts of turning the city into a world-class winter resort really only took shape after he had made the mountains of Krasnaya Polyana his personal ski retreat. No expense has been spared to convince Russians to visit Sochi’s slopes rather than head off to Europe’s traditional alpine resorts. Rosa Khutor, the crown jewel, has one of the world’s longest vertical drops and was built with the help of European and US experts. At the highest elevations, if you blink, you would think you were in Switzerland or Austria. Sleepy mountain roads are now filled with European-style ski chalets and pastel-coloured hotels. Olympic skiers who returned to the US from Sochi described it as surreal, as if Russia had built a winter Disneyland in the mountains. Critics in Russia and abroad have argued that Sochi 2014 is simply a pet project of Mr Putin, a grand attempt to put Russia back on the map by wildly overspending. They point to Russia’s extensive bureaucracy as the root causes of the estimated $50 billion (£30 billion) price tag, which officially makes Sochi the most expensive Olympics in history. However, that figure also includes extensive infrastructure spending on the city that is intended to boost its claim to be a tourist attraction long after the Games are over. Mr Putin himself recently put spending on the Games alone at $6.4 billion. 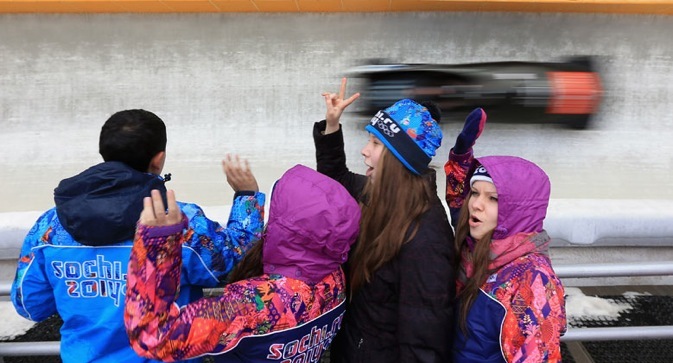 Sochi has big plans for its post-Olympic future. It will host the 40th G8 summit of world leaders in June and welcome Formula 1racing to Russia in the autumn. The Fisht stadium is an official venue when Russia stages the 2018 football World Cup. Russia’s arrival on the global sporting stage as host nation also fits a broader trend of the new global economic powers presenting the biggest events.It adds its name to a list that includes Beijing (the 2008 Olympics), South Africa (the 2010 World Cup) and Brazil (the 2014 World Cup and 2016 Olympics). However the costs of the Games are calculated, there is no doubt that Sochi will be one of thebiggest, most extravagant Olympics of recent times, perhaps ever. The 123-day Olympic torch relay, which covered a record 65,000 km (40,000 miles), included a space walk at the International Space Station, a visit to an active volcano, and an underwater trip in Lake Baikal. These Olympics promise the highest medal count and the largest number of events in the history of the Winter Games. Now all eyes turn to the athletes who have fed their dreams of Olympic and Paralympic glory with years of hard training. Sochi has prepared the stage for spectators and competitors to produce a dazzling festival of sport in the coming weeks, whose stories of triumph and heartache will be etched into Olympic history.